Test Knitting. Sample Knitting. Two things I find very important as a designer! But, what's the difference and why use one or the other? Test knitting is just that - a knitter tests the pattern. They knit the pattern as written, and usually use their own yarn. They provide notes to the designer within a deadline and they get to keep the finished item. Test knitters typically are not paid. They receive the pattern for free (and many designers compensate them with additional free patterns). 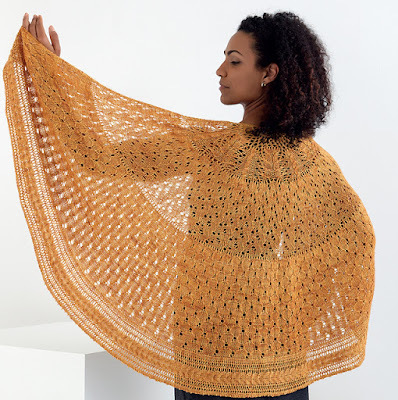 Some designers might use test knitters instead of a tech editor. That's not what I do, though, I personally find a tech editor to be a non-negotiable item when it comes to patterns. A tech editor, in addition to checking all the pattern math, will also edit things like format and grammar. Testers catch a lot of these things, but I don't rely on them for that. So when do I use test knitters? When I'm working on something new - like a new shawl shape or something that I haven't designed before. For example, when I designed Bandwagon, I had a group of test knitters for that shawl. It was a new shape for me, and I wanted to make sure that the pattern made sense to everyone! Lots of knitters enjoy doing test and/or sample knitting. You can search groups on Ravelry to learn more on how to get in on the test/sample knitting game. And, if you're interested in doing any sample or test knitting for me, be sure to join my Ravelry group. When I need a new sample knitter or I'm doing a test knit on a new design, that's where I post!